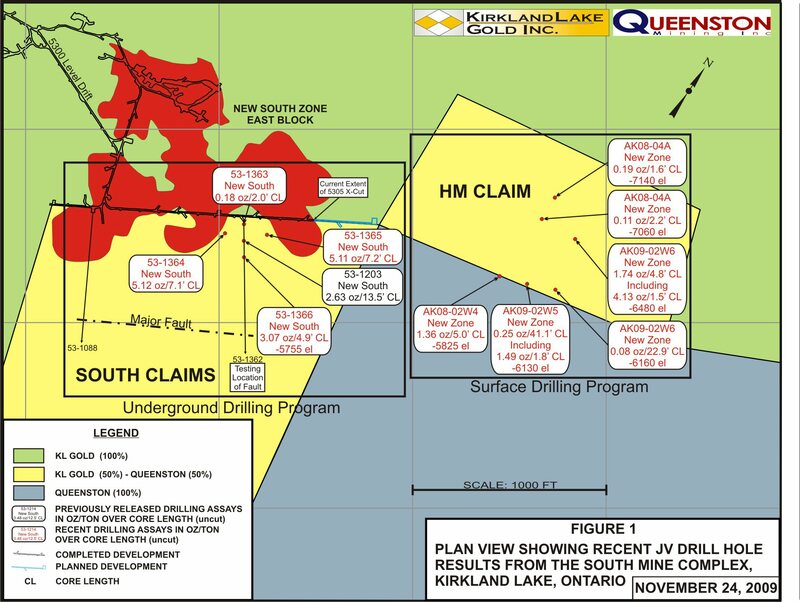 FOR:  KIRKLAND LAKE GOLD INC.
("SMC") and the HM Joint Venture property, both located south of KL Gold's Macassa Mine in Kirkland Lake, Ontario. opt cut) over a true width of 3.6 feet. which shows gold mineralization to be present east of the South Mine Complex." mineralization have been intersected some 1,000 to 1,300 feet east and on trend with the South Mine Complex." approximately 1,300 feet east and on trend of the existing mineral resource on the South Mine Complex. to begin later this year or early next year. formed between KL Gold and Queenston in 2007 and an underground diamond drilling program commenced on the South Claims. dated February 13, 2008, November 18, 2008 and March 18, 2009). report is available on SEDAR (www.sedar.com) under Queenston's filings. entitled Review of Resources and Reserves of Macassa Mine, Kirkland Lake, Ontario prepared by Glenn R. Clark, P. Eng. SMC (see KL Gold and Queenston press release dated February 12, 2009). that forms the basis of the technical disclosure in this release. also assisted in the preparation of the information that forms the basis of the technical disclosure in this release. laboratory re-assays at least 10% of all samples and additional checks may be run on anomalous values. camp is located in the Southern Abitibi Greenstone Belt of Kirkland Lake, Ontario, Canada. Charles E. Page, P. Geo. About this company Kirkland Lake Gold Inc.